Welcome to Day #7 of Chocolate and Nibs Theme Week. 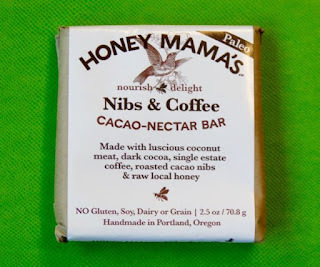 Today's Nibs, Coffee and Coconut Nectar cocoa treat was from Honey Mama's (Portland, OR). This raw honey-sweetened chocolate confection was softer and more textured than a conventionally tempered chocolate bar. It did not break with a hard snap; but it was full of natural flavors. If you like coconut, you'll like the natural shredded "coconut meat" flavor and virgin coconut oil in today's chocolate. Coffee and cocoa nibs provided additional taste and texture. 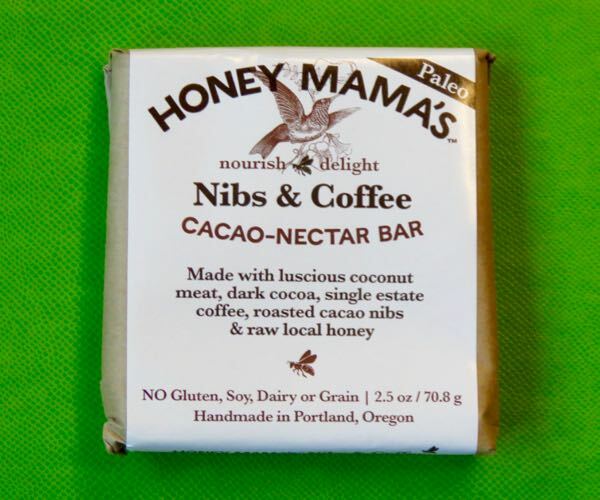 *Ingredients: raw, local honey; shredded Organic coconut; unrefined Organic coconut oil; Organic Dutch alkalized cocoa powder; Organic roasted cocoa nibs; single estate ground coffee; vanilla; and Himalayan pink salt. Honey Mama's bars are free from gluten, soy, eggs, dairy and grains.